Purinergic receptors have been suggested to play a role in the treatment of cytotoxic edema and brain infarctions. It was found that with treatment of the purinergic ligand 2-methylthioladenosine 5' diphosphate (2-MeSADP), which is an agonist and has a high preference for the purinergic receptor type 1 isoform (P2Y1R), significantly contributes to the reduction of an ischemic lesions caused by cytotoxic edema. Further pharmacological evidence has suggested that 2MeSADP protection is controlled by enhanced astrocyte mitochondrial metabolism through increased inositol triphosphate-dependent calcium release. There is evidence suggesting a relationship between the levels of ATP and cytotoxic edema, where low ATP levels are associated with an increased prevalence of cytotoxic edema. It is believed that mitochondria play an essential role in the metabolism of astrocyte energy within the penumbra of ischemic lesions. By enhancing the source of ATP provided by mitochondria, there could be a similar 'protective' effect for brain injuries in general. 1 2 3 North RA (Oct 2002). "Molecular physiology of P2X receptors". Physiological Reviews. 82 (4): 1013–67. doi:10.1152/physrev.00015.2002. PMID 12270951. 1 2 3 4 Burnstock, G. (2013). "Introduction to Purinergic Signalling in the Brain". Glioma Signaling. Advances in Experimental Medicine and Biology. 986. pp. 1–12. doi:10.1007/978-94-007-4719-7_1. ISBN 978-94-007-4718-0. PMID 22879061. ↑ Ulrich H, Abbracchio MP, Burnstock G (Sep 2012). "Extrinsic purinergic regulation of neural stem/progenitor cells: implications for CNS development and repair". Stem Cell Reviews. 8 (3): 755–67. doi:10.1007/s12015-012-9372-9. PMID 22544361. ↑ Cao Y, Tanaka K, Nguyen CT, Stacey G (Aug 2014). "Extracellular ATP is a central signaling molecule in plant stress responses". Current Opinion in Plant Biology. 20: 82–7. doi:10.1016/j.pbi.2014.04.009. PMID 24865948. ↑ Kaczmarek-Hájek K, Lörinczi E, Hausmann R, Nicke A (Sep 2012). "Molecular and functional properties of P2X receptors--recent progress and persisting challenges". 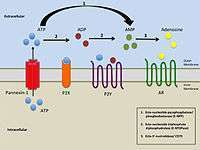 Purinergic Signalling. 8 (3): 375–417. doi:10.1007/s11302-012-9314-7. PMC 3360091 . PMID 22547202. ↑ Burnstock G, Fredholm BB, North RA, Verkhratsky A (Jun 2010). "The birth and postnatal development of purinergic signalling". Acta Physiologica. 199 (2): 93–147. doi:10.1111/j.1748-1716.2010.02114.x. PMID 20345419. ↑ Tsuda M, Kuboyama K, Inoue T, Nagata K, Tozaki-Saitoh H, Inoue K (2009). "Behavioral phenotypes of mice lacking purinergic P2X4 receptors in acute and chronic pain assays". Molecular Pain. 5: 28. doi:10.1186/1744-8069-5-28. PMC 2704200 . PMID 19515262. ↑ Ulmann L, Hirbec H, Rassendren F (Jul 2010). "P2X4 receptors mediate PGE2 release by tissue-resident macrophages and initiate inflammatory pain". The EMBO Journal. 29 (14): 2290–300. doi:10.1038/emboj.2010.126. PMC 2910276 . PMID 20562826. ↑ Tsuda M, Shigemoto-Mogami Y, Koizumi S, Mizokoshi A, Kohsaka S, Salter MW, Inoue K (Aug 2003). "P2X4 receptors induced in spinal microglia gate tactile allodynia after nerve injury". Nature. 424 (6950): 778–83. doi:10.1038/nature01786. PMID 12917686. ↑ Kobayashi K, Takahashi E, Miyagawa Y, Yamanaka H, Noguchi K (Oct 2011). "Induction of the P2X7 receptor in spinal microglia in a neuropathic pain model". Neuroscience Letters. 504 (1): 57–61. doi:10.1016/j.neulet.2011.08.058. PMID 21924325. ↑ Chessell IP, Hatcher JP, Bountra C, Michel AD, Hughes JP, Green P, Egerton J, Murfin M, Richardson J, Peck WL, Grahames CB, Casula MA, Yiangou Y, Birch R, Anand P, Buell GN (Apr 2005). "Disruption of the P2X7 purinoceptor gene abolishes chronic inflammatory and neuropathic pain". Pain. 114 (3): 386–96. doi:10.1016/j.pain.2005.01.002. PMID 15777864. ↑ Solini A, Chiozzi P, Falzoni S, Morelli A, Fellin R, Di Virgilio F (Oct 2000). "High glucose modulates P2X7 receptor-mediated function in human primary fibroblasts". Diabetologia. 43 (10): 1248–56. doi:10.1007/s001250051520. PMID 11079743.